Enhanced Super Digestive Enzymes by Life Extension helps with digestion. I just started taking these Enzymes but they seem to work just as good as the other high priced Enzymes. Enhanced Super Digestive Enzymes helps with digestion. Would recommend if you have mild digestive issues. Do you experience digestive discomfort after meals? One of the reasons is that your body produces fewer digestive enzymes as you age. 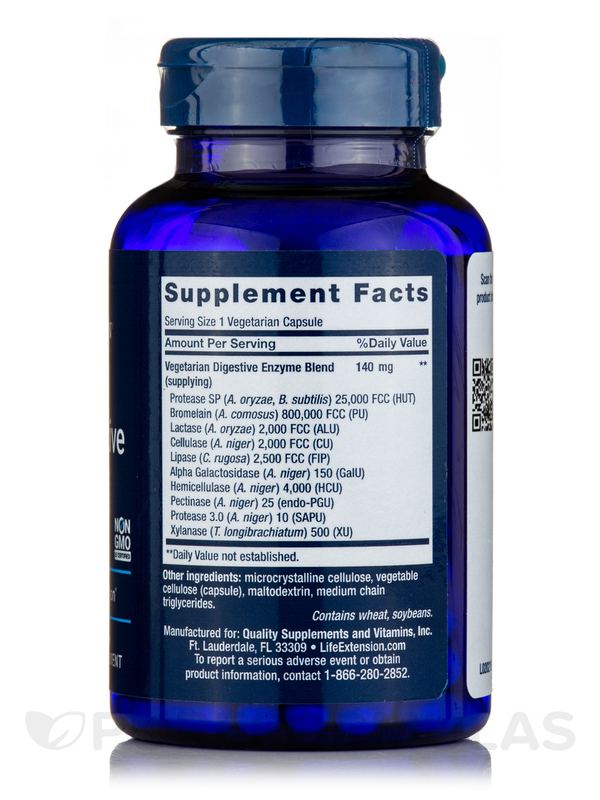 Enhanced Super Digestive Enzymes provides a powerful dose of amylase‚ protease‚ and lipase — pancreatic digestive enzymes that work in a variety of pH conditions to support the digestion of carbohydrates‚ protein‚ and fat. 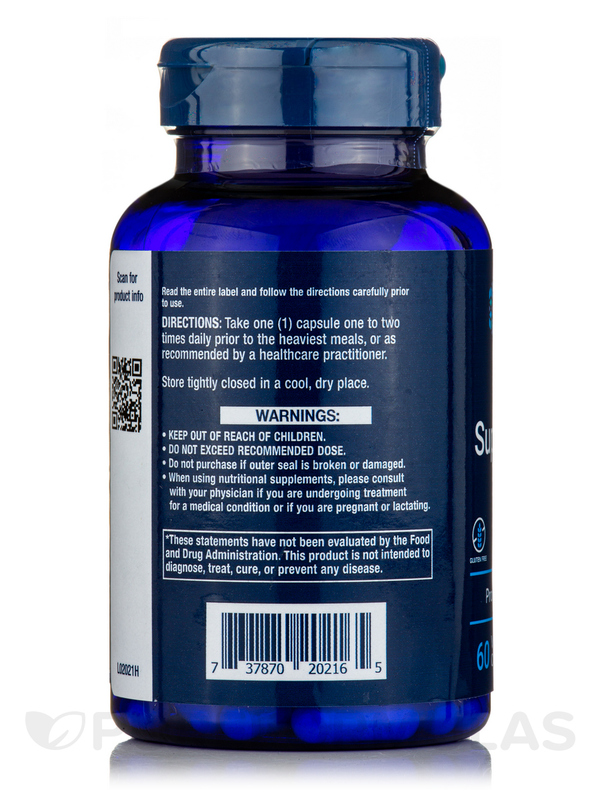 Fight back against age-related digestive discomfort with this innovative formulation. Enhanced Super Digestive Enzymes offers an array of powerful enzymes‚ including amylase‚ protease‚ and lipase‚ as well as a plant-based enzyme blend. Research has shown that supplementing with digestive enzymes can promote optimal digestion and better absorption of nutrients from the foods you eat. This novel formula was developed to improve digestion of proteins‚ fats‚ carbohydrates‚ lactose from dairy products‚ and hard-to-digest cellulose from vegetables. What's more‚ it has more potency than many commercial enzyme supplements and offers you greater digestive enzyme activity at a far lower cost. So stay comfortable after meals. Add Enhanced Super Digestive Enzymes to your regimen today. 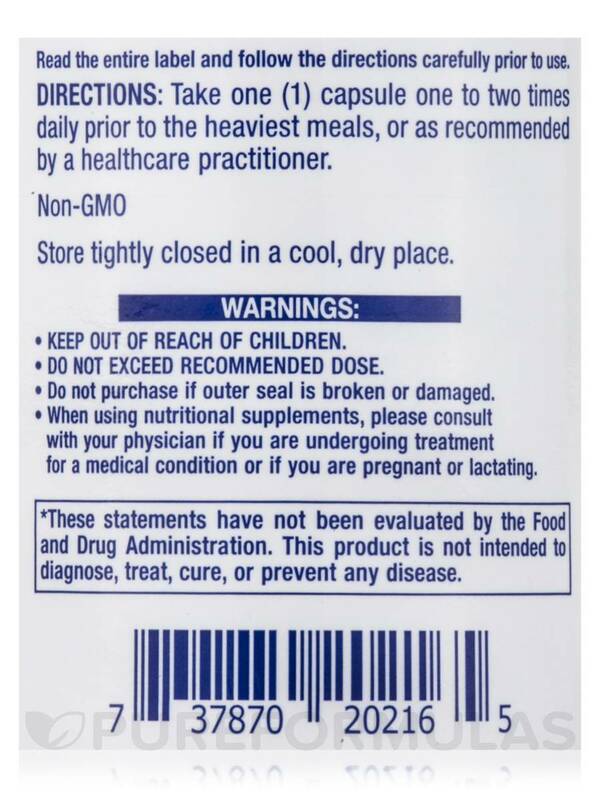 Other Ingredients: Microcrystalline cellulose‚ maltodextrin‚ delayed release capsule (hypromellose‚ purified water‚ gellan gum)‚ medium chain triglycerides. 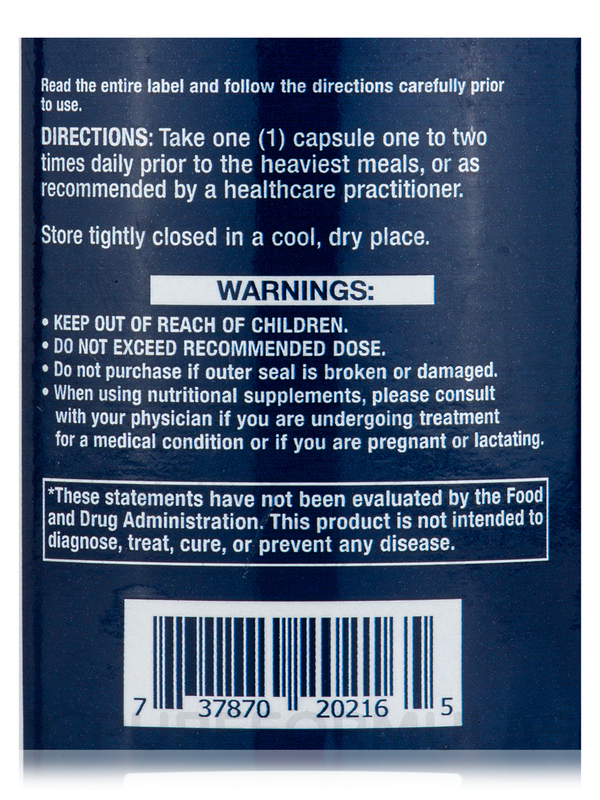 Take one (1) capsule one to two times daily prior to the heaviest meals‚ or as recommended by a healthcare practitioner. Allergen Caution: Contains Milk‚ Soybeans‚ Wheat. 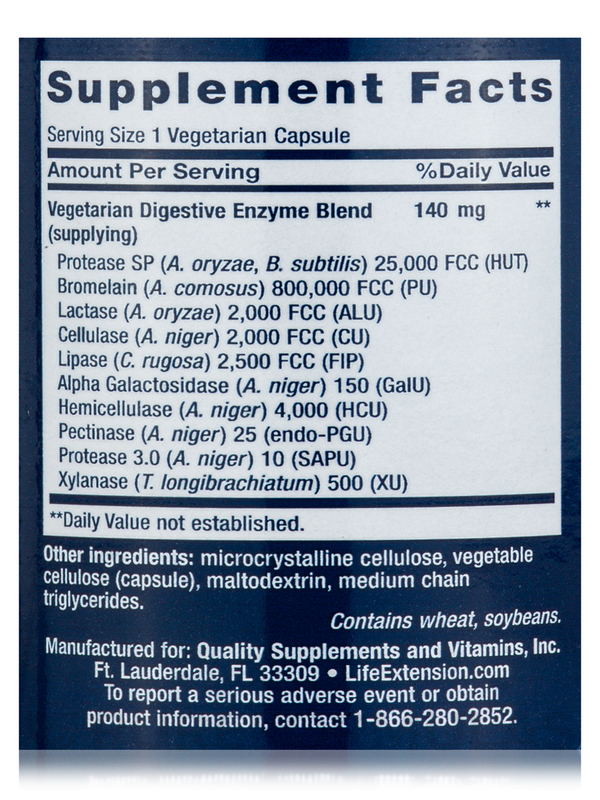 This Enhanced Super Digestive Enzymes by Life Extension is good. Though I didn't get much response to the enzymes for my digestive issues. Was not potent enough for my system. I have gastroparesses where I can't digest my food for 196 mins. Enchanced Super Digestive Enzymes by Life Extension really helps me digest my food.which helps with my pain. I love it because it really works. I have gastroparesis where I can't digest my food for 196 mins. Enhanced Super Digestive Enzymes by Life Extension really help me digest my food, which helps with my pain. I love it because it really works. I love it because it really works. 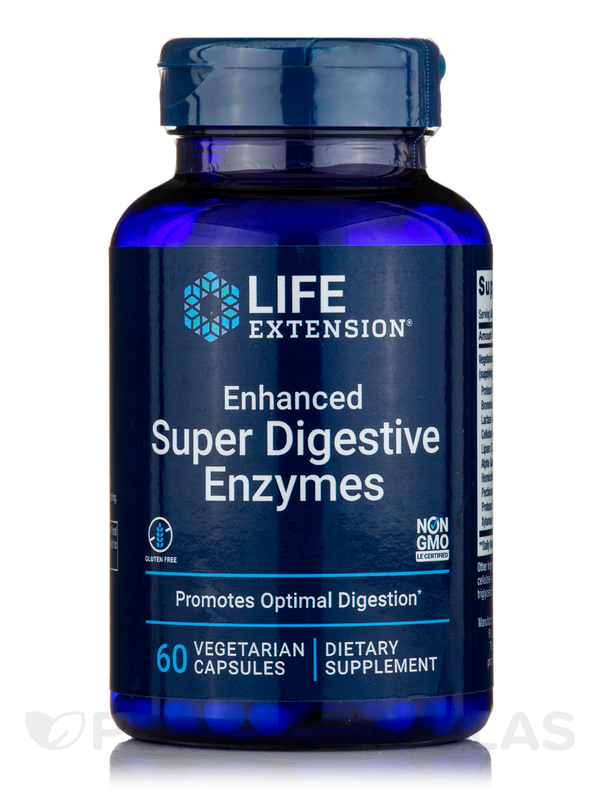 Enhanced Super Digestive Enzymes by Life Extension helps with digestion to alleviate a "too full" feeling after a meal. Is a good overall mix of many digestive enzymes for fats, carbs, and protein. i tried a bottle of these but didnt notice a difference so i switched brands. I would order this again...seems to favorably benefit digestion. The digestive enzymes worked well. Worked even better when I took two. I take Enhanced Super Digestive Enzymes due to my poor digestive system among other digestive aids. The older you get the more help we need with enzymes for digestion. I am extremely lactose intolerant so Enhanced Super Digestive Enzymes really helps me. Works great for me when I have an ice cream my stomach doesnt bloat.